Pigeon Forge Tennessee is one of the top family vacation destinations in the southeast. It is also second only to Las Vegas as a honeymoon destination for newlyweds. Pigeon Forge is the sister city to Gatlinburg Tennessee and is right outside the Great Smoky Mountain National Park. While Gatlinburg has a more intimate feel and you can walk the sidewalk shops and browse for several hours Pigeon Forge is more about attractions. Miniature golf, go carts, carnival rides and of course Dollywood are the setting in Pigeon Forge. There is continual action in Pigeon Forge throughout the year. With 16 city sponsored events, and growing, each year you will never run out of things to do. There are more than 40 attractions along the Pigeon Forge parkway. Get ready to enjoy Pigeon Forge with miniature golf, go-carts, bumper boats, water rides, laser games and even an indoor skydiving simulator. You are going to have a great time on your Pigeon Forge vacation. Besides all of the fun stuff to do in Pigeon Forge there are plenty of outdoor activities to enjoy. There is always the Great Smoky Mountain National Park The most visited National Park in the country. With its 500,000 acres you can almost never run out of things to do in this park. Cades Cove is one of the biggest attractions in the park and it is visited by more than 2 million people a year. Don't miss it! There are also 850 miles of hiking trails in the park with some incredible mountain vistas to behold. Our favorite hike is the 4 mile rather steep loop to Chimney Tops. You can find out more about hiking in the Great Smoky Mountain National Park here. 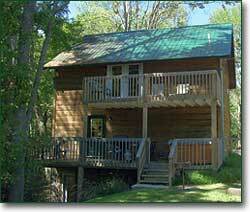 What could be better than staying in a cabin in the mountains around Pigeon Forge Tennessee? You will be able to enjoy some of the most incredible mountain scenery in the southeast while staying in a cabin in or around Pigeon Forge. Some cabins are perched right on the side of a mountain affording you the best view possible. To enjoy all that Pigeon Forge and Smoky Mountain National Park has to offer we recommend the service below to find your Pigeon Forge Cabin Rental.